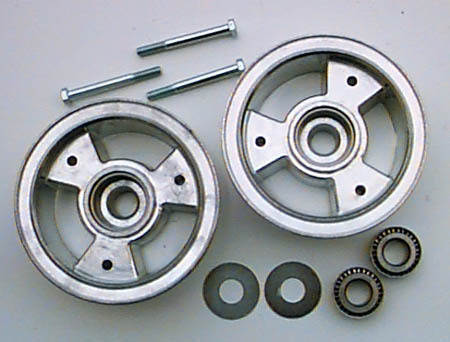 Our 5" Aluminum go cart style wheels feature a two piece split rim, bearings and grade 5 hardware. Rims are 3" wide and feature bead biting edges to prevent tire slippage. Widely used on KR's, Sonerai's, Dragonfly's and many other VW powered and ultralight aircraft. A set of two, along with tailwheel or nose wheel will safely support 1200 pounds gross weight. Our SLICK Tire and Tube Sets are used on many VW powered homebuilt aircraft. Slick tires have NO Tread and are very long wearing tires compared to ribbed go cart style tires. Tires have wear holes so you can visually see the depth of tire left. These are NEW 12" X 4.00 X 5" tire. They are comparable in diameter to an aircraft 500 X 5 tire, with a slightly narrower width... and at a fraction of the cost. Sets contain two tires and two tubes. We have a Pre-Welded 3/4" Axle, a 3/4" U-Build Kit and a 5/8" Axle Bolt and Slotted Nut. Our Pre-Welded 3/4" Axles are 6.5" long and are welded to a 2.5" x 2.5" steel plate. And the plates are drilled on 1.75" centers, with 1/4" holes. The axles come with two slotted nuts. The end is drilled 1/4-28 for wheel pant anchor. Builder must drill axles for cotter pin installation. This 3/4" Axle Kit includes two axles and two slotted nuts. Also included are two 2.5" x 2.5" with 1.75" centers with 1/4" holes. 5/8" U-Build Axle Bolts & Slotted Nuts. This can be a pair of bolts & nuts or one bolt & nut. No plate is included in this kit. Please send us an email or give us a call to Place Your Order! We accept MasterCard, Visa, Discover and PayPal! ​Information will be provided via your emailed Invoice on how to pay!